Nimble's remarkably light 120 gram stout wire spoke style front hub has a forged 6061-T6 alloy shell body with an oversized 4mm thick spoke flange. The oversized alloy axle system has a 17 mm diameter, creating an ultra stiff contact interface between fork dropouts. The dropout interfaces are spaced at the 100 mm standard. This hub is ready for Clydesdale riders or off-road riding with suspension front forks. This hub is used in the Horse FLY and Horned Toad front wheel. 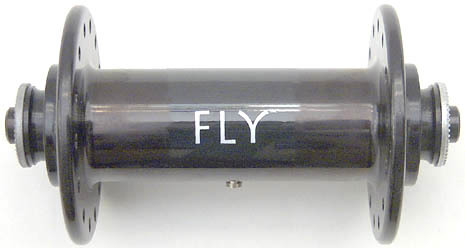 It is available in black in 28, 32 and 36 hole drillings. 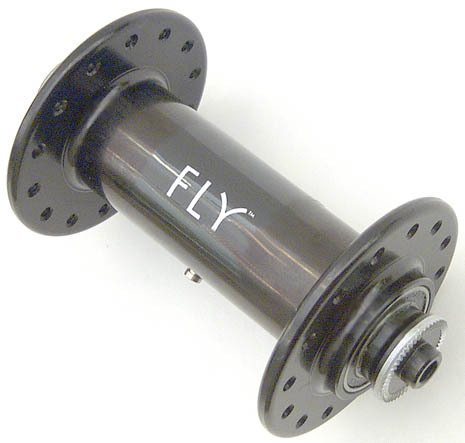 Also see wire front hub, wire rear hubs, Horse FLY, Horned Toad, and pricing.